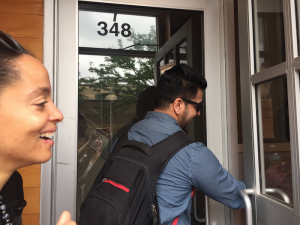 This summer, our team of Data Science for Social Good fellows at the University of Chicago has partnered with the New York City Mayor’s Public Engagement Unit (PEU) with the goal of helping them better target their outreach to tenants who may be experiencing housing-related issues (ranging from eviction to repairs to landlord harassment). New York City passed pioneering legislation guaranteeing low-income New Yorkers a right to free counsel in housing court, but these rights are hollow if at-risk tenants don’t know they have them. In 2015, a Tenant Support Unit was created within PEU to conduct proactive outreach to tenants to educate them about their rights and provide individualized assistance when they experience housing-related issues. Today, TSU’s work is more important than ever. New York City is experiencing a crisis of affordable housing that has only been compounded by the growing inequities between landlords and tenants. We’ve read many stories of tenants who have been mistreated by their landlords in various ways, including those highlighted in the New York Times’ recent series on New York’s affordable housing crisis, which uses both official data and interviews with tenants to trace the gradual loss of rent-stabilized apartments from 1996 to the present and the subsequent consequences for low-income tenants. 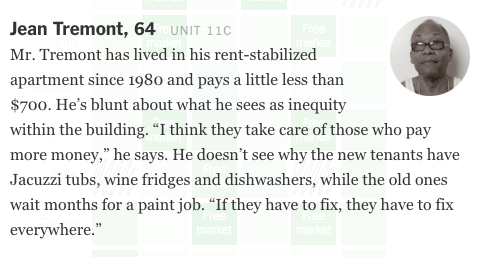 These stories range from those of tenants who feel neglected by their landlords (as Mr. Tremont, pictured below, does) to those of tenants potentially evicted on false grounds (as Mr. Sidibe, also pictured below, was). The New York Times story highlights the many tenants who could have benefited from the City’s legal protections from negligent and aggressive landlords if they had known about the services available to them. 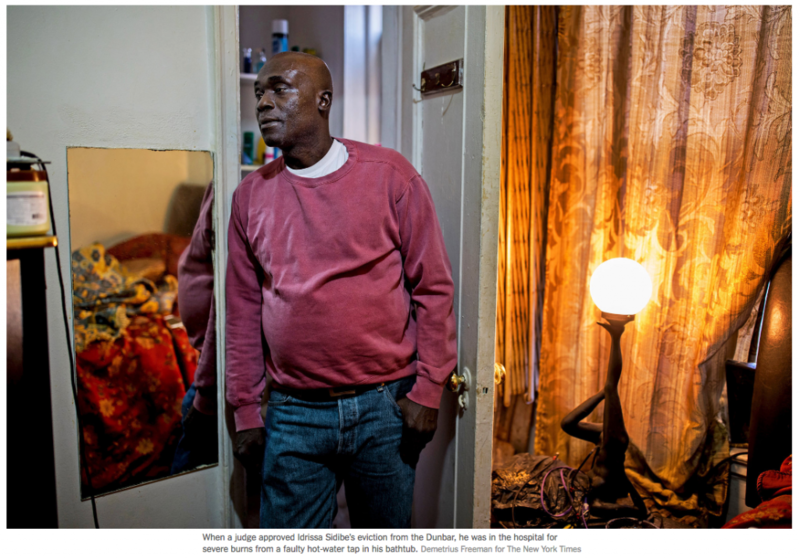 Our goal this summer is thus to help TSU better predict where tenants in need exist, so that they can help tenants like Mr. Tremont and Mr. Sidibe before their problems progress into cases dire enough to make the pages of the New York Times. 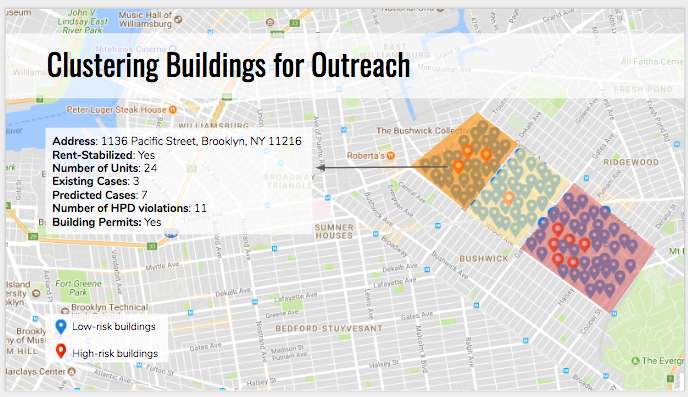 Over the past two months, our team has been digging deep into the data that might help us predict and prioritize which buildings to target for outreach. We’ve supplemented the data provided by our partner with additional, publicly-available data that give us more insight into landlord neglect in buildings–for instance, violations data from the Department of Housing Preservation and Development–as well as data that tell us about the demographics around a building, such as data from the American Community Survey. We’re using this data to build a model that predicts how likely a given building is to contain tenants who might be experiencing housing issues. As we build our model, we need to understand several things about TSU that numbers alone can’t tell us. How do outreach workers choose which buildings to visit? What might make a particular tenant more comfortable talking with an outreach worker about issues they’re facing with their landlord? Additionally, when might a tenant have housing problems but be nervous to report them? What about tenants who don’t know the City has programs to help them or don’t know how to report the issues they’re facing? To get insight into these aspects of TSU and more, we were fortunate enough to travel to New York City to spend a few days visiting our partner and getting insight into their daily practices. Our first day in New York was spent in the outer boroughs, accompanying specialists from TSU as they canvassed various areas in the Bronx, Bushwick, and Harlem. It was an eye-opening experience to witness the process first-hand and have conversations with specialists who we’d only previously known through opaque identifiers in our databases. 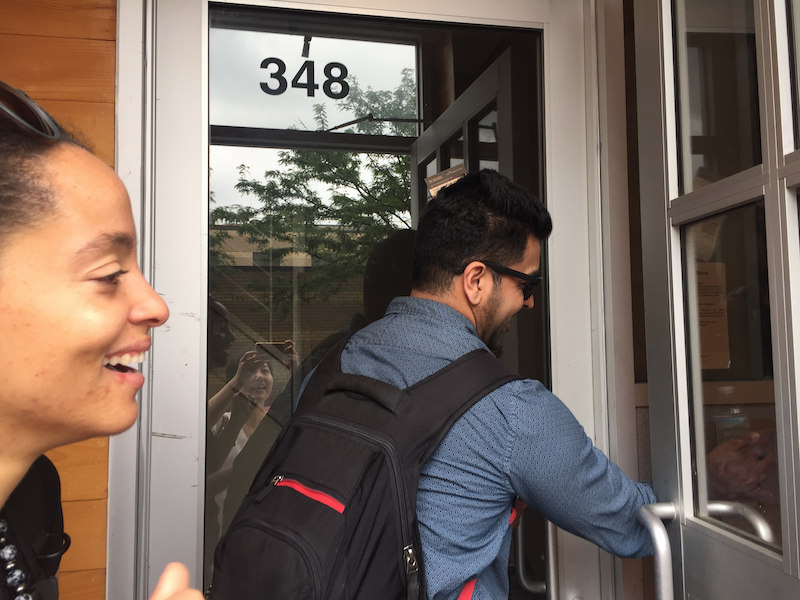 The time we spent shadowing various specialists as they canvassed (and later as they managed the cases opened for tenants experiencing housing issues) yielded several useful insights as we returned to our data in Chicago. For one, we learned that outreach teams operating in different boroughs, and even within the same borough, encounter very different challenges when knocking on doors to talk to tenants about housing challenges. 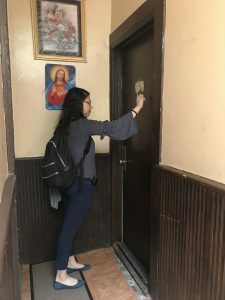 For instance, outreach teams in the Bronx have the benefit of knocking on doors in large buildings where many at-risk tenants are clustered, whilst teams in Brooklyn spend more time navigating smaller buildings. We also realized that the time it takes for an outreach team to get from building to building matters. Our initial proposed deliverable was a list of high-risk buildings in each borough that did not take the distance between buildings into account–so the highest-risk building might be located in a completely different area of the outreach zone than the second highest-risk building. This would have led TSU teams to spend large amounts of time traveling between buildings, time which could be spent talking to tenants instead. Our new proposed deliverable, pictured below, now focuses on prioritizing clusters of high-risk buildings, which will enable TSU outreach teams to spend their time more efficiently. 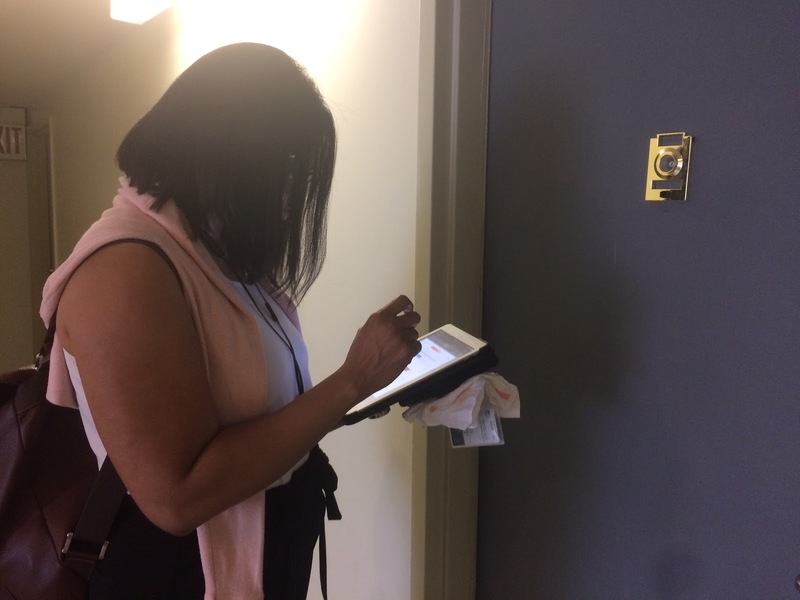 On reflection, the various interactions we had with our partner, TSU specialists, and tenants in New York City reminded us all over again about the human faces behind the numbers in our data, and only served to strengthen our belief in the necessity of connecting vulnerable tenants to city services. We hope that our work this summer will help TSU reach more New Yorkers like Mr. Sidibe and Mr. Tremont, and contribute to existing efforts to reduce tenant harassment in New York City.